Disruptive technologies drive industry innovation. Communication between a client and company is essential to an effective and mutually beneficial relationship. Canon Solutions America (CSA) recently hosted its 2014 Anniversary Event, which took place February 4 to 5 at its Boca Raton, FL production print solutions facility. Workflow is increasingly important to the efficiency of a modern printing environment. The Digital Solutions Cooperative (Dscoop) is an organization dedicated to providing business owners with education, networking, and business development opportunities and tools to help grow and succeed as businesses and professionals. The market for digital packaging and labels continues to show remarkable growth. 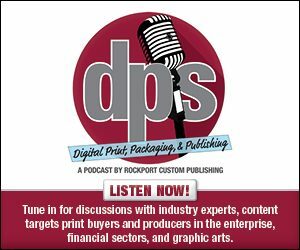 In our first annual Innovation of the Year Awards, DPS asked subscribers and vendor partners to nominate companies creating innovative solutions in digital printing, packaging, and publishing. We received many examples of creativity—applications produced using digital printing technologies. In our first annual Innovation of the Year Awards, DPS asked subscribers and vendor partners to nominate companies creating innovative solutions in digital printing, packaging, and publishing. Print service providers (PSPs) offer packaging prototype services to clients looking to test new marketing ideas. Finishing is an essential component in commercial print workflow. Digital wide format products enable a variety of applications. Konica Minolta Business Solutions U.S.A., Inc. held its annual Dealer Business Conference and product expo from November 17 to 20, 2013 at the Palazzo Hotel/Resort/Casino in Las Vegas, NV.